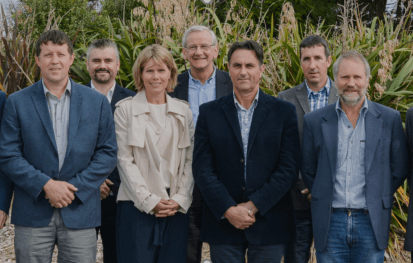 The Board consists of seven Directors – five elected farmer Directors and two appointed independent Directors. The Board of Directors are responsible for governance and leadership of Opuha Water and their main focus is ensuring the company is managed to the highest standard and the company’s strategy is implemented. They work to realise the company’s long-term corporate objectives, as it continuously strives to be a leader in the irrigation and water sector. Ryan O’Sullivan (Farmer Director), Paul Burns (Independent Director), Nicky Hyslop (Vice Chair, Farmer Director), Tom Lambie (Farmer Director), Milne Horne (Chair, Farmer Director), Brendan Caird (Farmer Director), Jeremy Boys (Independent Director).